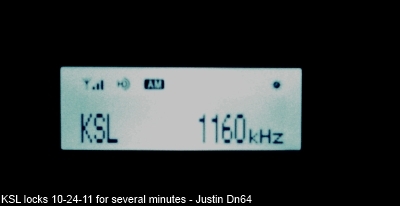 - Indicates HD Radio signal was received but did not lock. - Indicates an HD Radio signal lock. - Will appear if this station has locked in HD and picture of RDS was taken. - QSL received. Some have pictures. See more terms in the glossary below the log and maps. KTNN 660 Window Rock 5-16-11 50/50 DIR Country/Navajo "The Voice of the Navajo Ntn"
KFI 640 Los Angeles 6-12-11 50/50 Not DIR News/Talk Confirmed twice! KFIA 710 Carmichael 6-17-12 25/1 DIR Religious Only religious on freq. KTNQ 1020 Los Angeles 5-4-11 50/50 DIR Regional Mexican Mixing with other stns. KFBK 1530 Sacramento 7-25-11 50/50 DIR News/Talk Ided! "KFBK!" KFSG 1690 Roseville 11-3-11 10/1 Not DIR Spanish Only Spanish station on freq. 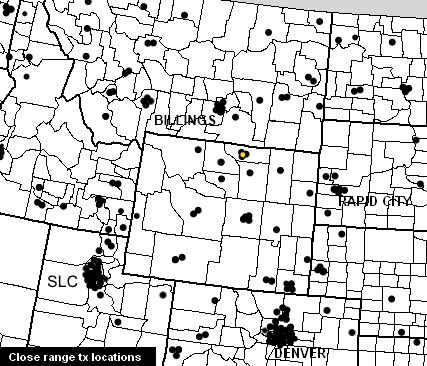 *KCBS is one of the hardest stations to catch in some places, and easy in others. In Sheridan, there are at least 4 or more stations that all compete with it at night. I heard "KCBS News" pop out of the mess. 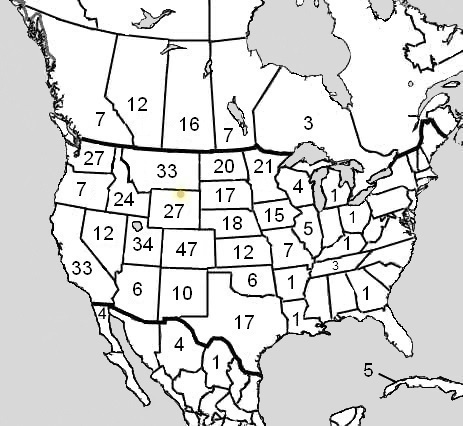 It was buried under KVOX from North Dakota. I have been trying for nearly two years to get the station. KRAI 550 Craig 5-13-11 5/500w DIR Country Under another stn. KJOL 620 Grand Junction 9-18-13 5/79w Not DIR Religious // online stream at sunset! KLTT 670 Commerce City 5-23-11 50/1.4 DIR Religious "670 KLT - 50,000 watts"
KJMP 870 Pierce 10-31-11 1/320w Not DIR Sports "ESPN Radio 870"
KDZA 1350 Pueblo 6-12-11 1.3/150w Not DIR Sports "Homer 1350"
KEZW 1430 Aurora 5-23-11 10/5 DIR Nostalgia "Studio 1430"
KBJD 1650 Denver 5-4-11 10/1 Not DIR Regional Mexican Only likely SS on freq. KBRV 800 Soda Springs 11-8-11 10/150w Not DIR Adult Contemporary Still mentions 790 + format mat. WMT 600 Cedar Rapids 5-4-11 5/5 Not DIR News/Talk Clear ID+lcl ads!! KHPP* 1160 Waukon 6-7-11 880/26w! Not DIR Oldies/Mix // online!! Likely on day power! KRNT 1350 Des Moines 5-17-11 5/5 DIR Nostalgia (reconfirmed x2) WX forcast for Central Iowa! 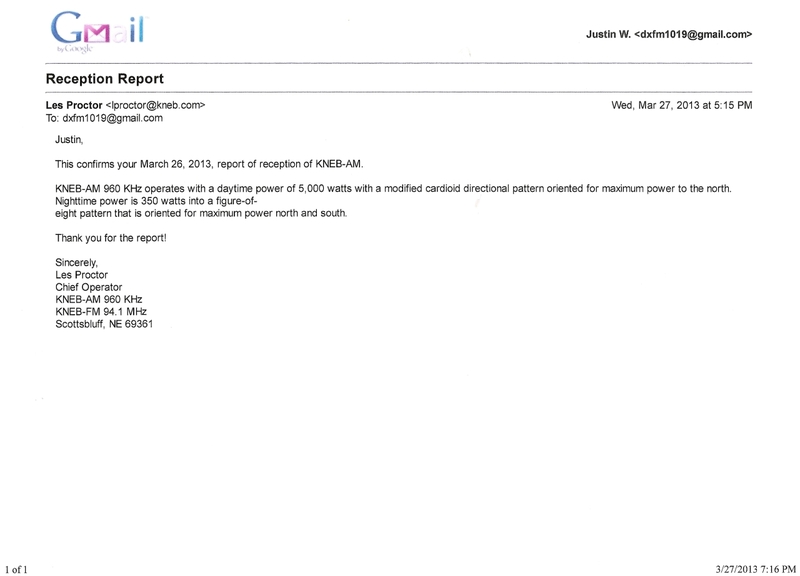 * - KHPP was likely on day power, but was readable under KSL. I listened online as they were playing "Babe" by Styx, and it matched the over the air signal. I believe the recording is their slogan. KQNK 1530 Norton 8-12-11 1/0 Not DIR Classic Hits Reconfirmed x2 on day power. KVGB 1590 Great Bend 7-25-11 5/5 DIR Talk Multiple IDs + good clr sig. *I heard mentions of Lafayette Square + an ID under heavy co-channel interference from KRVN. WREY 630 St. Paul 12-15-14 1/2.5 DIR Regional Mexican (#342) Matched with online stream + "La Rey"
** - KHMO was indeed on day power the evening of this reception, as confirmed via correspondence from the engineer. He says the computer has Windows 2000, and occassionally forgets to flip to the night pattern! 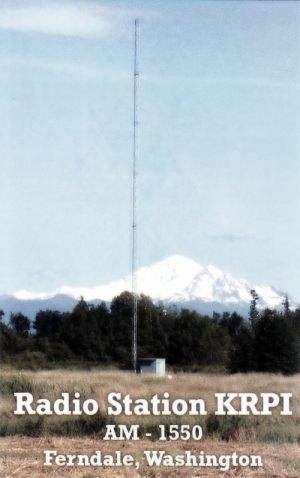 This is one of the few times an engineer has helped us confirm the reception of a station. KHDN 1230 Hardin 1-29-13 1/1 Not DIR Talk (poorly managed) About Friggin Time! KMMS 1450 Bozeman 1-16-15 1/1 Not DIR News/Talk (#356) Local theater in "downtown Bozeman"
KBRX 1250 O'neil 1-30-13 1/44w! Not DIR Country (likely on day pwr) MULTIPLE ID + lcl ads!!! KOLT 1320 Scottsbluff 9-21-11 5/1 DIR News/Talk "News/Talk 1320 KOLT"
KLMS 1480 Lincoln 2-6-13 1/750w Not DIR Sports // online "ESPN 1480"
KDWN 720 Las Vegas 1-29-13 50/50 DIR News/Talk ID under WGN "KDWN"
KLSQ 870 Whitney 12-7-11 5/430w DIR Spanish Highest power SS on freq. KWWN 1100 Las Vegas 1-14-13 22/2 DIR Sports "ESPN 1100"
KCMY 1300 Carson City 1-29-14 5/500w DIR Classic Country (#316) Stn was likely on day power. KXEQ 1340 Reno 11-26-12 977.4w Not DIR Regional Mexican ID in jumbled mess. See here. KKOB 770 Albuquerque 5-17-11 50/50 DIR News/Talk "New Mexico's Monster"
KDIX 1230 Dickinson 2-5-13 1/1 Not DIR Classic Hits // online with sports bcast. KFAQ 1170 Tulsa 5-4-11 50/50 DIR News/Talk Good sig! KGYN 1210 Guymon 7-10-11 10/10 DIR Country Under KHAT + other stns. KFXY 1640 Enid 6-12-11 10/1 Not DIR Religious Solid copy of "Faith 1640"
KDUN 1030 Reedsport 2-4-15 50/630 DIR Oldies Buried under KTWO - // online. 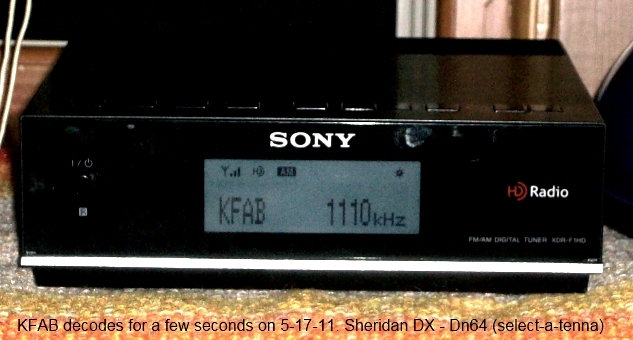 KKLS 920 Rapid City 7-4-11 5/111w DIR Oldies Daytime DX - weak. KOKK 1210 Huron 9-21-11 5/900w DIR Farm (Country mix) "Dakota Country KOKK!" KILT 610 Houston 8-20-13 5/5 DIR Sports Only CBS Sports on 610. KAMA 750 El Paso 1-11-15 10/1 DIR Spanish (#350) // online + mentions of Texas. KIJN 1060 Farwell 3-4-14 10/0 Not DIR Spanish Religious (#327) Day power - Mentions of "Christo"
KRLD 1080 Dallas 5-4-11 50/50 DIR News/Talk Clear! WOAI 1200 San Antonio 8-8-11 50/50 Not DIR News/Talk Only likely talker on freq. KSVN 730 Ogden 4-1-13 1/66w Not DIR Spanish Only SS on freq clos enough. KWDZ 910 Salt Lake City 4-25-11 5/1 DIR Radio Disney Heard "Radio Disney AM 910"
KSOP 1370 S. Salt Lake City 11-17-11 5/500w DIR Classic Country "Classic Country 1370"
KXOL 1660 Brigham City 5-4-11 10/1 Not DIR Regional Mexican Only SS on freq close enough. KOMO 1000 Seattle 7-10-11 50/50 DIR News/Talk "KOMO 1000"
KPTK 1090 Seattle 10-30-12 50/50 DIR Progressive Talk Show matches. KRLC 1350 Clarkston, Lewiston 5/1 DIR Country (Mix?) IDed once following song. *ID for KRPI was recorded during a DX test at 02:04 MST on 2/26/12. KRPI was on the day rig during the recording. *WTDY is one of only four stations on 1670. It was the only talk station I heard. I heard a weather forecast, and then a clear ID into local ads for Madison! KGAB 650 Cheyenne 5-30-11 8.5/5 DIR News/Talk "Cheyenne Weather"
KTWO 1030 Casper 4-25-11 50/50 DIR Talk/Country Strongest stn in the state. KRKK 1360 Rock Springs 5-15-11 5/1 DIR Conserv. Talk Local WX + I know the stn. CKUA 580 Edmonton 12-7-12 10/10 DIR Public Radio "CKUA Radio Networks"
CHQR 770 Calgary 12-9-12 50/50 DIR News/Talk Local Ads + ID! CFAX 1070 Victoria 8-28-13 10/10 DIR News/Talk/Sports Weather forecast and "CFAX"
CKWX 1130 Vancouver 7-10-11 50/50 DIR News "News Radio 1130"
CHMB 1320 Vancouver 10-17-11 50/50 DIR Asian Clear language match. CKLQ 880 Brandon 7-24-13 10/10 DIR Country Clear ID under KRVN! CKSB 1050 Saint Boniface 7-25-11 10/10 DIR Ethnic (French) Clear ID + "Manitoba"
CJRB 1220 Boissevain 10-17-11 10/10 DIR Classical / Mix Program match. CBK 540 Watrous/Regina 5-4-11 50/46 Not DIR News/Talk/CBC Clear mentions of CBC etc. CBKF2 860 Saskatoon 10-17-11 10/10 DIR French (CBC) Confirmed per GR. *I am unsure of the call letters or other information about Radio Rebelde on 710 or 1620. If you know, get in touch... dxfm1019 at gmail dot com. XED 1050 Mexicali 12-30-14 10/10 Not DIR Regional Mexican (#346) SS + match w/ online. Stations indicated with after the city of TX were received on the date indicated. The radio used for stations heard on 4-25-11 (the first official Sheridan DX) was the Grundig Traveler II in a Super 8 hotel in town with poor RX conditions. 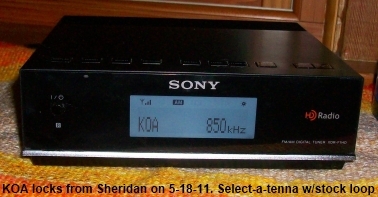 Normally, a Sony XDR-F1HD, Grundig G8 Traveller II, stock radio in 2010 Subaru Impreza (Outback Rocky Mountain Edition w/ RDS), and/or the Grundig S350, are the primary radios at different locations in town. Some receptions were made with a 2002 Subaru Outback which is no longer in my posession. RIP Ubasu I. // - Usually means confirmed with or confirmed online with webstream. -In the case of HD Radio, you'll see what a lock looks like (if a picture has been taken that is). Click this to see the station's calls. *** - UBSTUDIOS Pledges that no advertisements will ever appear in popup form on this or any other www.ubstudios.com site. We do not condone popup advertisement and it is the main reason we moved to a new domain in the first place. Angelfire was horrible about advertisements, we will never do this. If you do receive a popup while surfing this site, you may have spyware on your computer. We recommend downloading a free copy of Spybot Search and Destroy. This link will take you to download.com an outside source. We are not responsible for the content of outside links.